Want to know the best area to stay in Paris with your family? If you’re visiting Paris for the first time, you might be wondering where is the best area to stay in Paris? As with most large cities in the world, there are good areas and not-so-good areas. 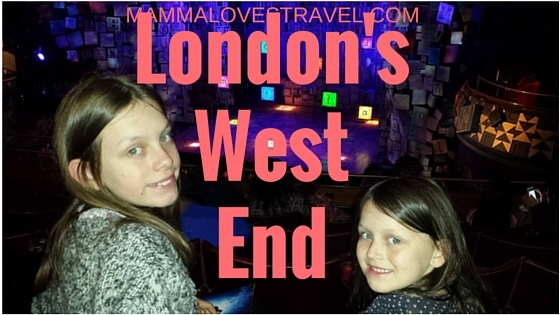 When choosing where to stay in Paris with kids, it’s a good idea to know which are the bad neighborhoods in Paris and which are safe and family-friendly. 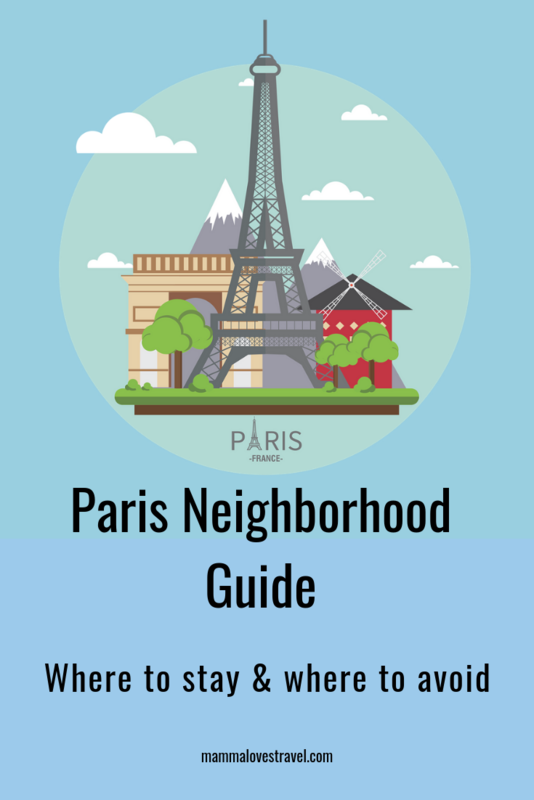 The following Paris Arrondissement Guide explains the different neighborhoods and quarters within Paris, and what you can find in each arrondissement. This will help you choose the best area to stay in Paris for your family. Note: This post was originally published in September 2016, but was updated in February 2019. Latin Quarter Popular with students. Paris is divided in half by the river Seine, with the area north of the Seine known as the right bank, and the area south of the Seine known as the left bank. Paris is organised into 20 administrative neighborhood districts known as “Arrondissement”, or quarters. Each quarter has its own distinct character that makes it unique and also handy for tourists trying to find where to stay in Paris. The quarters begin in the central part along the Seine, and move in a clockwise direction until they reach the outside quarters of the city. Often, travelers want to know what arrondissement the Eiffel Tower is located in, while others want to know what arrondissement is the Latin Quarter in Paris. 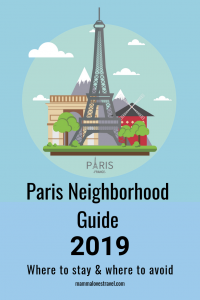 I have compiled an easy-to-read Paris arrondissement guide for you to find out about each of the quarters and work out where to stay in Paris. I also point out where the main tourist sights and attractions are. This is important to know before you book your family’s accommodation. The 1st arrondissement is the geographical center of Paris and is located on the right bank (Rive Droit), north of the Seine.It is busy with tourists visiting the Louvre Museum, Jardin des Tuileries, Place Vendome, Les Halles and Palais Royal. Hotels in the 1st arrondissement tend to be quite expensive, but the advantage of staying in the 1st is that you are only a stone’s throw from some of Paris’ major tourist attractions. This is great if you are only staying in Paris for a short time and plan to walk everywhere, or if you’re visiting Paris for the first time and don’t want to get yourself lost. The 1st arrondissement is generally one of the safest areas to stay in Paris. Click here for hotels in the 1st arrondissement. The second quarter, also located on the Right Bank is primarily a business district. The Paris Stock Market (the Bourse) is located within this quarter. The eastern neighborhood is traditionally a garment manufacturing district, also known as Sentier. But nowadays, it is home of many start-up companies, and is jokingly referred to as Silicon Sentier. 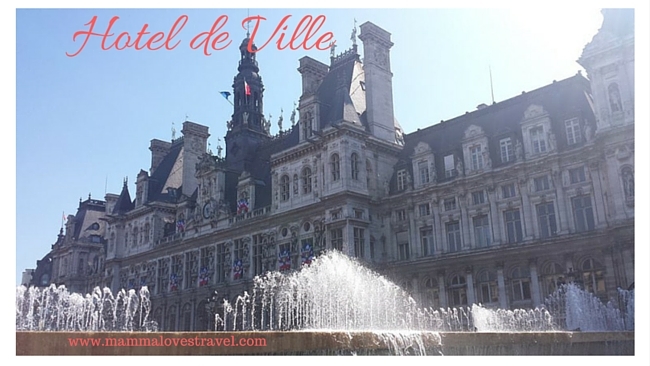 Although there isn’t much in the 2nd arrondissement for tourists, it is generally a safe and quiet neighborhood and there are a great selection of hotels here. Click here for hotels in the 2nd arrondissement. Looking at the Paris arrondissement map, you can see that the trendy and very touristy Le Marais (which translates into English as The Marsh) comprises both the 3rd and 4th quarters. 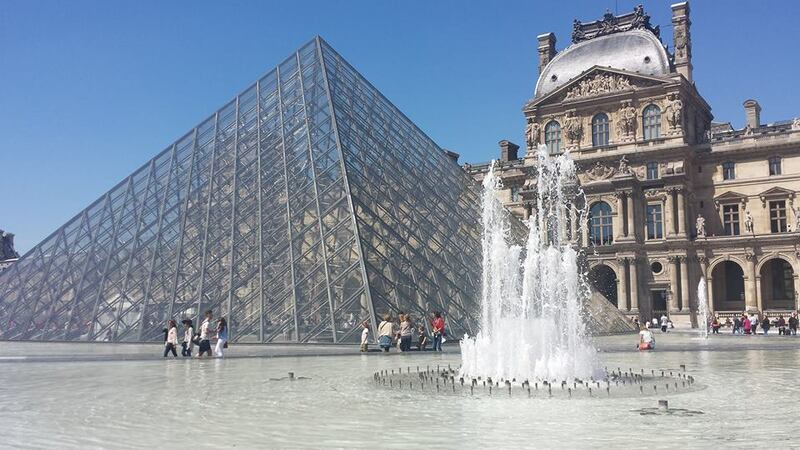 Here, you will find the Picasso Museum and Musee Carnavalet, as well as many excellent restaurants and shops particularly in the Jewish quarter. The Marais is also gay-friendly, and the northern section of the district is home to a Chinese Community. Le Marais has also had its fair share of famous residents, including Victor Hugo, John Galliano and Jim Morrison. As the Marais is popular with tourists, and if you are looking for the best family hotel in Paris, it’s worth looking for a hotel in this quarter. You could easily find some of the best Paris hotels in the Marais district, as it’s a safe and popular area. Click here for hotels in the 3rd arrondissement. If you’re a history buff, then you may want to stay in a hotel in the Medieval quarter of Paris, the 4th arrondissement. In this quarter, you will find the two islands of Paris: Ile de Louis and Ile de la Cite which are the two oldest parts of Paris. The Ile de la Cite was the birthplace of Paris over 2000 years ago and here you will find the Notre Dame Cathedral. Most people visit the Ile de Louis for an ice-cream from Berthillon, the most famous ice-cream retailer in Paris. The two islands still contain a small number of medieval homes and buildings. Such a contrast to the rest of Paris!In the 4th, you will also find the Centre Pompidou, St Chapelle, Place des Vosges as well as the Hotel de Ville (the town hall). Click here for hotels in the 4th arrondissement. 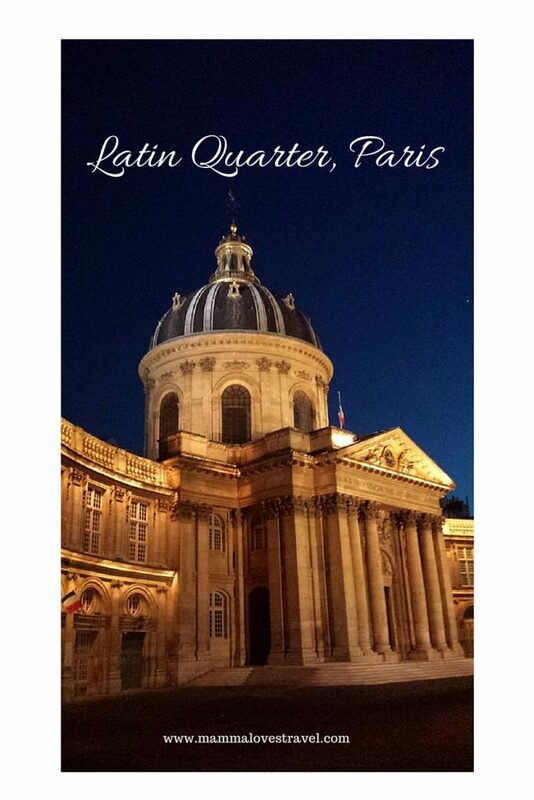 The Latin quarter is known as the student district. The Latin quarter is home to one of the first universities in the world, the Sorbonne, which was built circa 1150. The university makes this area popular with students. You will also find the Pantheon, Odeon and the Jardin du Luxembourg. Not far from here is the National Museum of Natural History in the Jardin des Plantes- this is a very popular attraction for families. If you love food and markets, the Saturday food market on Rue Mouffetard is a must-see. This quarter is lovely to walk through- its cobble stoned streets still have a few medieval buildings mixed together with takeaway and souvenir shops. Closer to the Seine near St Michel, you will find many takeaway shops and souvenir shops. The St Michel area of the Latin Quarter is packed with tourists, so it’s busy and loud- be careful of pick pockets! To keep your valuables safe while exploring the streets of Paris, I highly recommend the Travelon Anti-Theft Messenger Bag which we used last time we visited Paris. When deciding where to stay in Paris, you will have no trouble finding the best family hotel and accommodation options in this quarter. Click here for hotels in the 5th arrondissement. The fashionable 6th quarter is home to many designer brands: Prada, Emporio Armani, Swarovski, Louis Vuitton and Longchamp. The 6th quarter is one of the best areas to stay in Paris if you want to do some serious people watching. 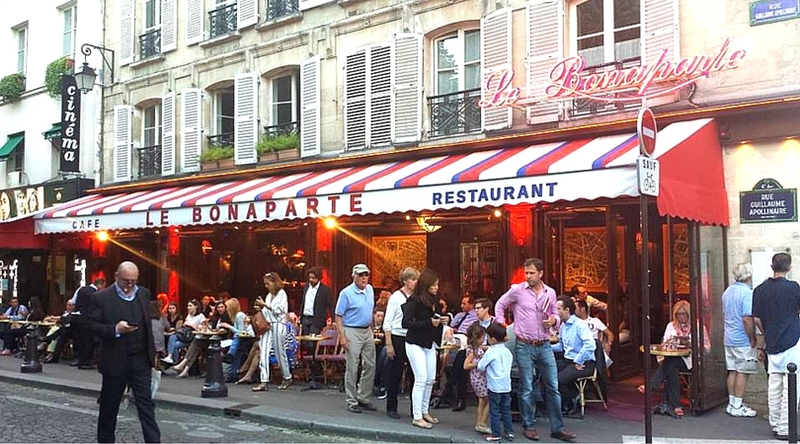 Almost every street corner has a cafe or bistro, with people sitting out on the street, watching Parisian life go by. 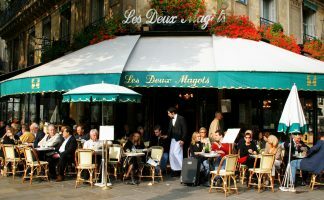 The world-famous Cafe de Flore and Les Deux Magots can be found in the 6th. 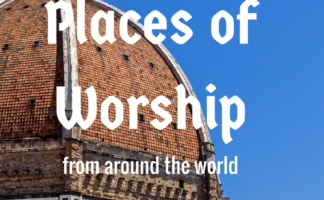 This is where people go to see and be seen, and has been the haunt of many famous people over the years: Ernest Hemingway, Brigitte Bardot, Sharon Stone, Robert de Niro, Yves Saint Laurent. Lots of tourists come here as well. Other notable tourist attractions in the 6th quarter are the Luxembourg Gardens and St Sulpice Catholic Church, which was mentioned in the novel The Da Vinci Code (however, permission to film the movie here was declined). There are some lovely hotels in this quarter. Click here for hotels in the 6th arrondissement. If you’re visiting Paris for the first time, you’re probably wondering what arrondissement the Eiffel Tower is located in. The 7th quarter is home to the Eiffel Tower, and many tourists look for places to stay near the Eiffel Tower, especially families with young children. The wealthy 7th quarter is home to foreign embassies and important international visitors. Traditionally, France nobility lived in this quarter, and it is sometimes referred to as the Faubourg neighborhood. 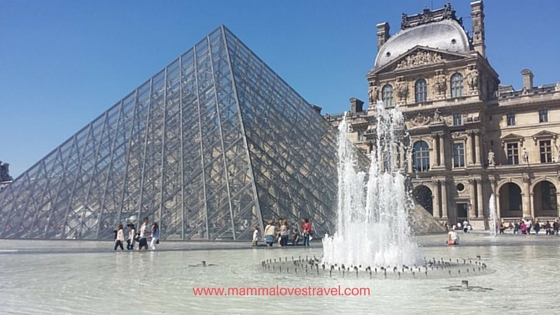 The main attractions in this quarter are of course, the Eiffel Tower, as well as the Musee Rodin (famous for the sculpture “The Thinker”), Les Invalides (home of Napoleon’s tomb) and the excellent Musee d’Orsay along the Seine. 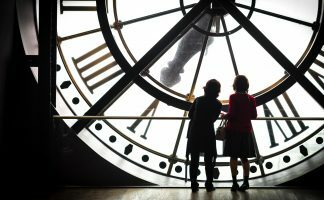 The Musee d’Orsay is an unused railway station that has been converted into a grand museum. Its collection features paintings and sculptures by Monet, Manet, Degas, Cezanne and Van Gogh. Well worth a visit, especially with older children with some knowledge of art. It is also the location that the kids’ movie Hugo is set in. If you are looking for the best family hotel in the 7th quarter, expect the accommodation prices in this area to be in the upper range. For everything you need to know about visiting the Eiffel Tower, please read HERE. Click here for hotels in the 7th arrondissement. One of the most famous roads in the world, the Champs-Elysees is the finishing point of the Tour de France held annually in July. The 8th quarter is a mixture of wealthy Parisians and tourists, and is also the largest business district in Paris. There are plenty of excellent hotels to find in this quarter. Other sights worth seeing are the Arc de Triomphe, Place de la Concorde and the Elysees Palace, which is the French President’s home. Click here for hotels in the 8th arrondissement. The 9th arrondissement, located on the right bank, is a diverse neighbourhood- at one end is the opulent Palais Garnier, while at the other end is Pigalle (translates to Pig Alley), which is on the border of the 9th and 18th arrondissement: home to Moulin Rouge and Paris’ red light district. When looking for the best family hotel to stay in, try to avoid Pigalle which tends to be unsafe. This is one of the bad neighborhoods in Paris. Notable tourist attractions include Boulevard Haussmann (a must-see for architecture enthusiasts) and the large department stores Galeries Lafayette (worth visiting at Christmas) and Printemps. Click here for hotels in the 9th arrondissement. If you are arriving in Paris by train, you will most likely begin your Paris journey in the 10th quarter which is the home of two of Paris’ major train stations: Gare de l’est and Gare du Nord. The 10th quarter is situated on the right bank. Along the canals (which are reminiscent of Amsterdam) are many cafes and restaurants. The 10th quarter is an ethnically diverse neighborhood- there is a Turkish minority in this neighborhood, so Parisians often refer to this area as “La Petite Turquie” (Little Turkey). In recent years, it has become a very trendy neighborhood. On the weekends, the streets along the canal are car-free to make room for cyclists and rollerbladers. Lots of young people hang out here! Click here for hotels in the 10th arrondissement. The 11th quarter is largely a residential area- in fact it is one of the most densely populated cities in Europe. It is a quarter with varied neighborhoods- to the east, there are many large markets and children’s parks. The Oberkampf area is popular for its nightlife. In recent years, the areas around Boulevard Voltaire and the Avenue Parmentier have become one of the trendiest areas in Paris. Unfortunately, the 11th arrondissement was where the November 2015 terrorist attacks occurred. Tourists now ask whether the 11th arrondissement is safe, which is a shame because the quarter has a very lively, community feel to it. Click here for hotels in the 11th arrondissement. Bercy is a large residential neighbourhood, best known for the Bois de Vincennes, the largest public park in Paris. Its features include four lakes, a zoo, a botanical garden, a velodrome for bicycle races and a horse-racing track. Click here for hotels in the 12th arrondissement. This quarter was part of a large urban renewal project- it is a mixture of modernized buildings on cobblestone streets, with numerous cafes and restaurants. It is also home to Paris’ Chinatown and is a very multicultural neighbourhood. Click here for hotels in the 13th arrondissement. The 14th quarter is also largely residential and has numerous cafes that were once visited by writers and artists such as Hemingway, Fitzgerald and Picasso. It is now known for its controversial skyscraping tower (Montparnasse) which offers great views of Paris, as well as the morbid but fascinating Paris Catacombs (recommended for teens!). Click here for hotels in the 14th arrondissement. The 15th quarter is the most populated arrondissement. The Montparnasse tower is located on the border of the 15th and 14th arrondissement. There are a few lovely hotels to stay in this quarter. Click here for hotels in the 15th arrondissement. The 16th is a very wealthy neighborhood although not as wealthy as the 7th. 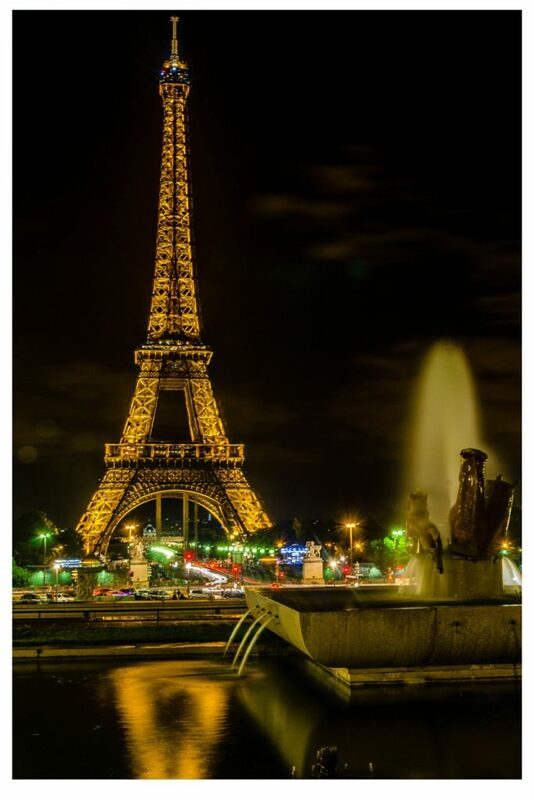 Go to the Place de Trocadero for excellent views of the Eiffel Tower. Click here for hotels in the 16th arrondissement. The area near the Arc de Triomphe and Parc Monceau is very upmarket, while the Batignolles neighborhood is more bohemian (hipsters hang out here). There are no tourist attractions here, but if you want to see what the real Paris is like, it’s a great place to stay. 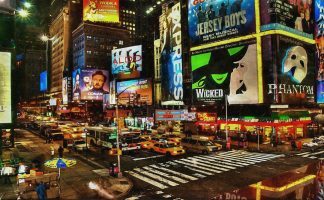 You can find my top pick for the best hotel in this neighborhood here. Click here for hotels in the 17th arrondissement. A residential neighborhood set high on a hill overlooking Paris, Monmartre is a very popular area for tourists wanting to visit Sacre Couer and Place de Tetre. Its also popular with artists and con-artists/pickpockets- the steps leading up to Sacre Couer is one of the most pick pocketed areas in Paris. 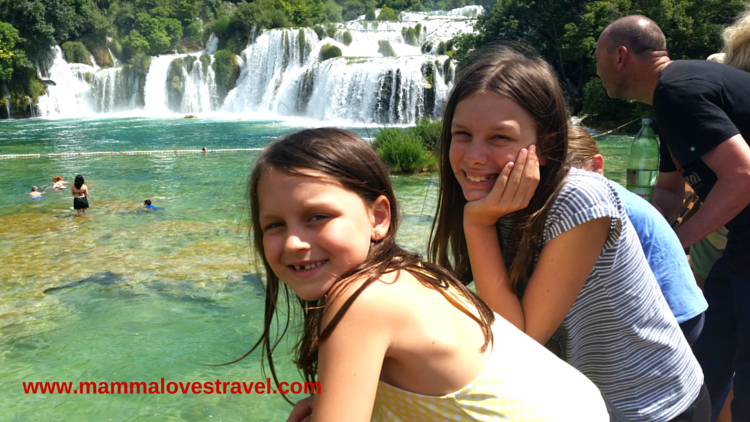 If you are looking for the best family hotel on a small budget, you are bound to find a few options in this quarter! Click here for hotels in the 18th arrondissement. Home of Parc de Butte Chaumont, one of the largest parks in Paris complete with a temple and an artificial lake. The 19th quarter is an ethically diverse residential neighbourhood that also features the Cite des Sciences and Cite des Enfants (popular with families). Click here for hotels in the 19th arrondissement. Traditionally, the 20th arrondissement was the place where migrants would live. Now there are neighbourhoods within the quarter that are very cosmopolitan. 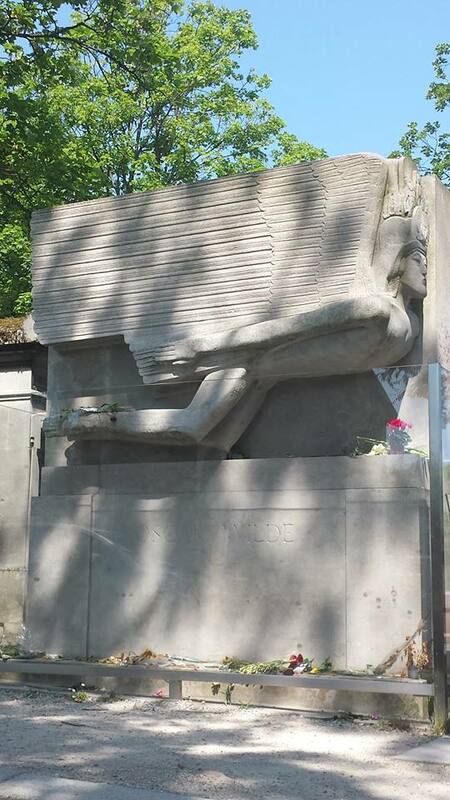 The most well-known attraction in this quarter is the cemetery Pere Lachaise, resting place of many famous people including Oscar Wilde, Edith Piaf and Jim Morrison. Click here for hotels in the 20th arrondissement. Which sights and attractions do you plan on visiting during your time? 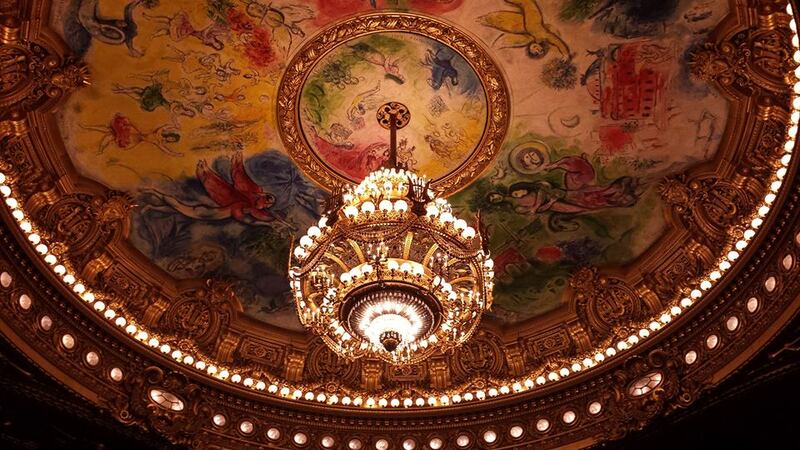 Here are some suggestions on what to do in Paris with kids. Work out which areas of Paris you will spend the most time in and try to find somewhere to stay in these areas. Are you wondering how many days to stay in Paris? This all depends on what you want to see and do. Knowing how long you will be spending in Paris will be helpful when booking your accommodation. A short visit means you are better off closer to the main attractions or you will waste time and money on the Metro. Generally, the closer you are to the main tourist areas, the more you will have to spend on accommodation. The further out of Paris you stay, the more you will have to spend on Metro tickets. What amenities are important to you? Markets, supermarkets, ATM machines, restaurants, cafes? Do you prefer a quiet neighborhood or one that is lively? Personally, I would recommend staying close to the major attractions if you are only in Paris for a short time. If you are there for a weekend or a few days, then staying somewhere in the 4th, 5th, 6th or 7th quarters would probably be ideal. If you are staying a bit longer, then you could stay a bit further out if you wanted to find cheaper accommodation. This is only my personal opinion, but here are the Paris Neighborhoods I would avoid. For families, I would avoid parts of Montmartre or the Pigalle area of the 9th quarter. If you prefer a quieter neighborhood, I would avoid the 5th quarter particularly around St Michel as this area is overrun with tourists and is very lively at night, as is the Marais district. For 20-somethings, this would be perfect! We stayed in the 6th quarter near St Sulpice and Jardin du Luxembourg. We loved being in this quarter! We had all the amenities we needed- supermarket, cafes, boulangerie, pharmacy and we were across the road from the Metro. The kids loved the playground at Jardin du Luxembourg. It was not very touristy and we were able to walk to places such as the Louvre, Notre Dame and Musee d’Orsay. It was quiet at night and also very safe. Highly recommended! For those who want something a little different, here are some quirky hotels in Paris you could check out! I hope that my guide and advice is useful to helps you decide where to stay in Paris the next time you visit. Has your family been to Paris and if so, which quarter did you stay in? What did you think of the neighborhood you were in? Please share your thoughts- you could be helping another reader! Disclaimer: This post contains affiliate links. If you make a purchase or booking via these links, we may be paid a small commission without any extra cost to you. Thank you for supporting our family! I’ve stayed in Marais,5th and 6th. I’d stay as close to Jardins de Luxembourg if there with little kids, tho if we go again,we’d stay on the island, as we spent a lot of time roaming and eating there, on our way from Marais to JdeL. Bercy is fun, and would be cheaper to stay in. But extra time on the Metro to the main sights – but at night, all very easy and cute. This is excellent advice. We have only visited once and although our apartment was ok, the area was devoid of any restaurants, so we always had to travel elsewhere for dinner. I shall make a note of this post for when we visit again, thanks. Thanks for sharing! We really like Montparnasse and typically base ourselves here when we visit Paris for the weekend from Dublin. It makes all the difference staying in the right area, doesn’t it? Thanks for stopping by Cathy! I agree with all of your arrondissement descriptions. I’ve never actually had to rent an apartment in Paris since I’ve always had accommodation in the Banlieue/suburbs, but I’ve seen areas that look better than others every time I’ve gone into the city! 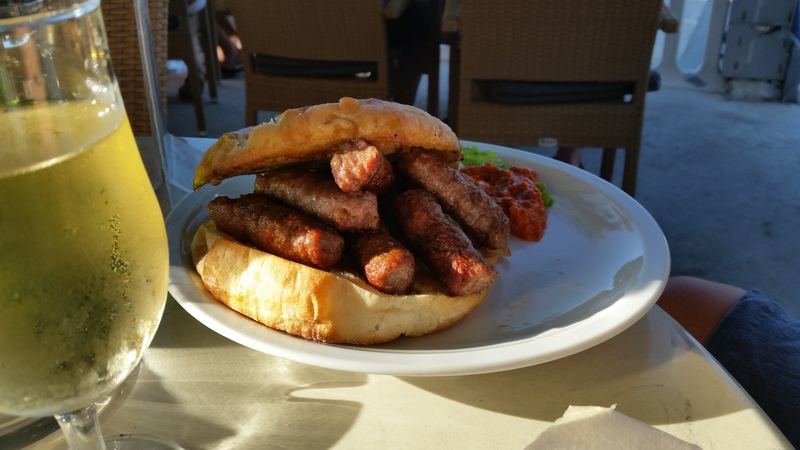 Great post and it should be very helpful for visitors! Thanks Christy! I guess places change too- some areas that were once not so nice can change and become the next popular place for visitors. Thanks for stopping by! What a great guide! I’m a bit biased since I lived in the 3eme arrondissement for three years and just love the Marais – but I can see why you love the 6eme as well! And it really depends where you are in the 3rd – my street was so quiet (actually the same street as the Picasso museum), but it was easily accessible to the more lively action at night, so I felt like it was the best of both worlds. I also love the 11th and would consider renting an apartment there on vacation – so many of my favorite restaurants are over there, plus outdoor markets I love! Thank you! I’m off in November, and I haven’t booked my hotel yet. Been there twice, but still don’t feel like I know the city. This helps! Have a great time! I’ll be sharing some great hotels to stay in Paris over the coming weeks, so be sure to come back and have a look. As 20-somethings we stayed in a goregous little hotel in the Marais and it was fabulous.